A groundcover shrub that forms a fine textured, dense mat. 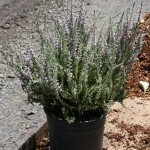 The single blooms are lavender and the foliage is silvery-gray. The blooms appear in July thru September. 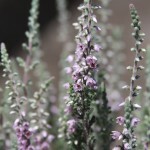 It grows best in full sun in an acidic, well-drained soil. Shear lightly after flowering to maintain a tidy form.